With the new chaos vortex on Bubonicus Tundra growing bigger and bigger every day we must march to the plains of this land, we must put Lightnig Storms to the place and purge it with Sigmar`s thunders. No more Malign Portents will affect this holy land of Sigmar! Nine Relictor Temple Lords will march unified! Under the one Relictor Chamber Master, under my command! Lord Relictor of Exemplar Chamber is truly “knightly” one. Proud, confident and shiny with his prayer totem as a Sigmar`s shield. 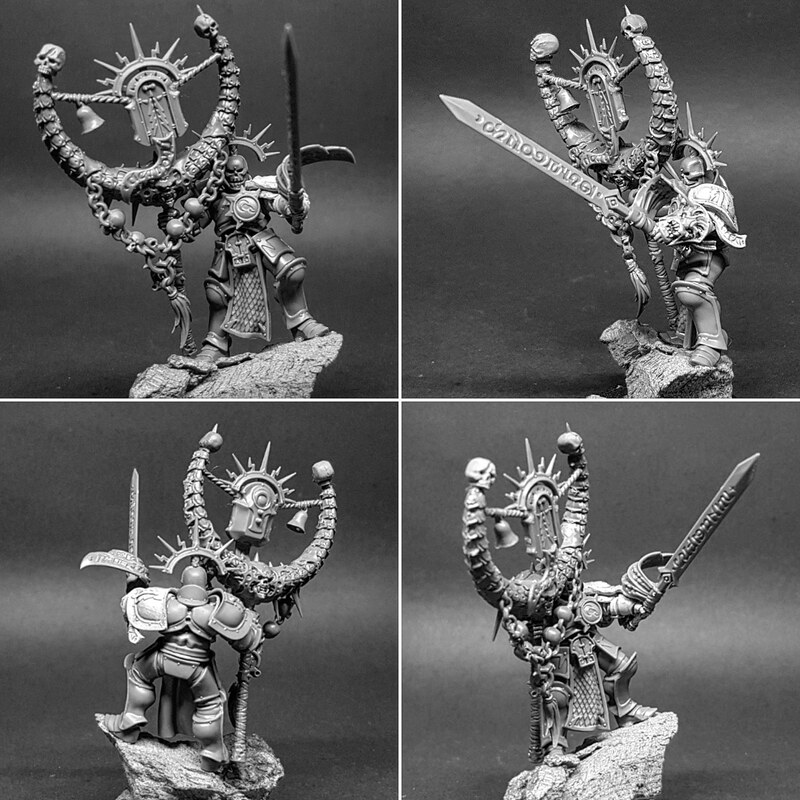 Lord Relictor of the Ruination Chamber is rather creepy with daemonic totem full of skulls, chains and with only small Sigmar Prayer Icon Box in the middle. He is death incarnate, calling his prayers close to Realm of Death! 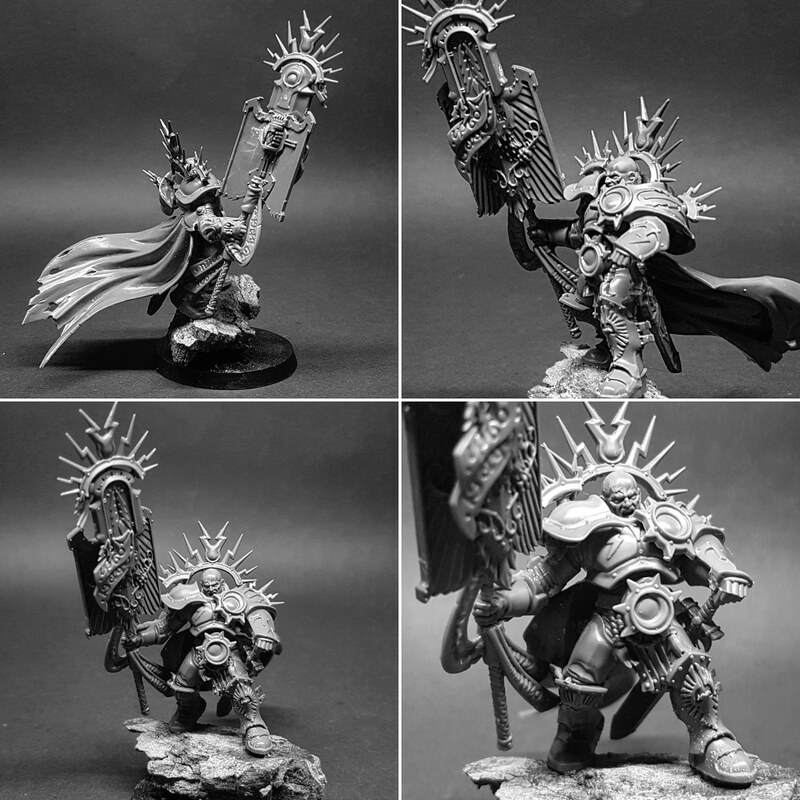 A Stormhost is organised into several chambers and commanded in war by the Command Echelon – graduates of the temples dedicated to the disciples of the officer cadre. It is within these temples that the Lord-Celestants, Lord-Relictors and other lords and knights of the Stormhost are trained and equipped before they are assigned to specific chambers. Apart of this – no more detail. Nine Lords. One for each Chamber. Nine avatars of transition between life and death. Nine of them united and standing together on the soil of Tundra Bubonicus. Surrounded by hundreds of Liberators, flanked each side by Dracothian Guard and backed with Judicators. They are here for simple purpose: to grind through daemons of Chaos, to cleanse the land of taint, mutation and evil. Prosecutors. Balance of power is changing. They will come like crows diving sharp for the weak and dying prey. This dry noise of their wings, with silence in the background and unechoed thump of their feet hitting the ground. Soil wet with enemies blood, their ceremonial canvas flags waving heavy. Rod wings of aetherrion steel stained with gore. Nemesis and katharsis. They are Prosecutors. Liberators. Enter the realm of lost hope. It was a ghastly morning, not much different from dawn. You could only tell it is the start of the day by the dim spot on the sky where the sun used to be. They came without a sound. Lifeless, motionless, monumental. With Sigmar`s rage and wrath hidden under porcelain-like armour. Their anger and frenzy on hold. Not for long. I am Gastos Rhor. I am the one of space and time where being is trapped and yet free to fight. I do no longer remember why am I here or when did I die. All my memories from other dimensions melted together in angry fury and frenzy of tangible violence. I fly through millenia of memories, strange banners flapping around shafts, dragons, shields and horses. All this seconds later transformed in visions of steel birds dropping burning comets of armageddon. I got no flesh, just starstone porcelain hard armour. I bath in blood and gore of those who oppose Sigmar. I am the master, I am the slave. Perfect colour scheme, perfect idea and setting. I am going to develop this theme from where he stopped.